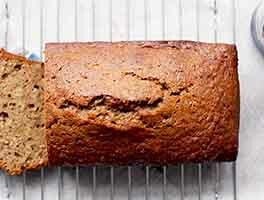 Chocolate meets banana in this version of one of the most popular breads we know. We like to make two mini loaves so one can be eaten straight away, and the other can be tucked away for later. Preheat the oven to 350°F. Lightly grease two 3 1/4" x 5 3/4" mini loaf pans, or one 9" x 5" loaf pan. Combine the flour, baking soda, salt, and cocoa. In a separate bowl, beat the butter and sugar until light and creamy. Beat in the egg, then stir in the vanilla, banana, and sour cream. Gently mix in the dry ingredients and chocolate chips until well incorporated. Pour the batter into the pan(s) and bake for 45 to 60 minutes (bake for the shorter time for two mini loaves and the longer time for the larger loaf), until a cake tester or toothpick inserted into the center comes out clean. Remove the bread(s) from the oven, and allow to rest in the pan(s) for 10 minutes. Turn the bread(s) out onto a rack to cool completely. Yield: one 9" x 5" loaf or two mini loaves. This bread tastes great, but I cannot get it to bake properly. I've checked my oven temperature and leavening agents and everything is fine. Just baked a 9X5 loaf for 1 hour and 15 minutes and let it rest, but it still came out cooked on the top and sides, but nearly raw in the center and bottom. Not sure what's happening. Made this exactly as directed and the people I gave it to said it was fabulous - moist and delicious. However, as another reviewer (Janeanm on 02/04/2017) commented, the loaf collapses a bit as it cools. The example photo shows this as well. However, this doesn't affect the taste. 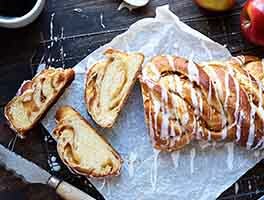 I made this recipe this morning. I baked it as muffins instead of bread and they were moist and delicious. I baked them for 20 minutes and that was perfect. I used the KA Dutch process cocoa. This one is a keeper. I just made this today for the first time. First, I hate sour cream and had no yogurt on hand so I improvised and used a 3.25 ounce cup of Snack Pack Chocolate Fudge pudding instead of the sour cream. I also used Ghirardelli cocoa powder. I followed the directions to the letter and then use the Bake cycle on my bread machine and let it bake for one hour. A butter knife came out clean after an hour and the smell in my apartment was amazing. I waited about 15 minutes and cut a piece to try and now I'm afraid that I am going to eat the whole loaf of the thing today. It's AMAZING. Moist and INCREDIBLE. Thank you for this recipe. I cannot say enough how amazing this tastes! This is good banana bread! 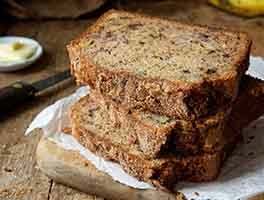 With most banana breads, the banana flavor is so overwhelming, it's difficult to taste anything else. This is not like that. The chocolate to banana flavor is a nice balance. Also, this recipe is very easy and forgiving. We added pecan pieces to the mix just for a little crunch. I made this with my 10-year-old granddaughter and it was very easy to follow and execute correctly. We made one larger loaf instead of two smaller ones. The loaf rose nicely and made a very nice loaf of banana bread. We cooked it at 350F degrees on "Convect Bake" and while watching it, we noticed it was fully risen and looked done at about 40 minutes. We checked it for done-ness and the probe came out clean but for the melted chocolate. I do not like gooey cake so we let it cook another 3 minutes just to be sure it was finished. Then we took it out and turned it onto a cooling rack. It was perfect! We added a chocolate ganache icing because, well, because my granddaughter likes icing on her cake. The loaf is a bit crumbly when slicing it but we liked it that way. We will make this again for sure! Love this recipe! I left out the chips and added toasted walnuts and a tsp of espresso powder. Also, used plain yogurt instead of the sour cream. Lastly, sprinkled struesel that I had left over from making coffee cakes on top of my mini loaves before baking. So Good! It seemed that I had to bake this loaf a bit longer as my toothpick kept coming out very wet. This is one of the best breads I've baked this Christmas season. It's a very moist and rich flavored bread. I would highly recommend this recipe. 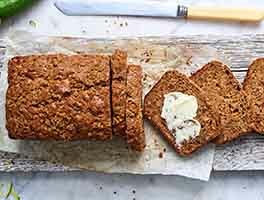 I've made this recipe a couple of times and literally the loaves are gone in a day. 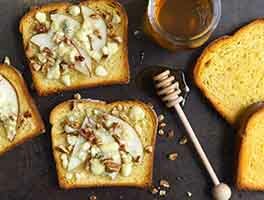 This makes a very moist loaf with the perfect touch of sweetness. I reduce the sugar as per KAF suggestions, and I also reduce bake time by alot. I don't know if it's supposed to be baked within an inch of its life or just my oven is weird but I set my timer for 20 minutes and start checking on it every 5 minutes from there. Generally it only needs 25 min. Tonight I'm going to try this without cocoa to make a regular banana bread bc I've had such better results with this recipe than the original . I've made this recipe at least 3 times and it always comes out delicious. I did have some problems when I made it yesterday (which was the first time in about a year). I baked it for 40 minutes and then starting checking on it every 5 minutes. At 60 minutes a toothpick was still coming out a little wet, but I didn't want to overbake it so I took it out anyways. Per the instructions, after ten minutes of cooling in the pan, I turned it over to remove it from the pan and it cracked in half (top split from bottom). What did I do wrong?